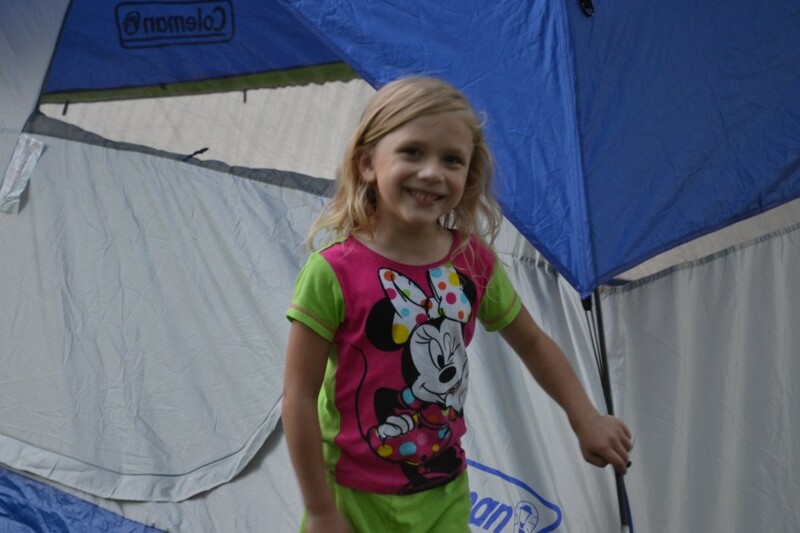 We took a really nice, short, easy with small kids, camping trip earlier in July. We stayed at the same camp site we always do! It is our favorite! 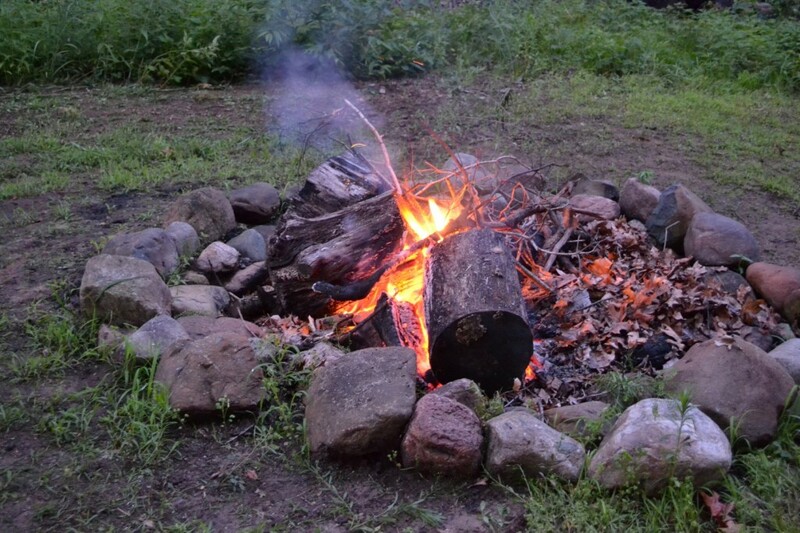 We do most of the same camping things that we would do at a real camp ground. We eat dinner outside, play on the swing set, go for a bike ride, “hike” through our woods and the nature preserve behind us, sleep in a tent, and we make s’mores. 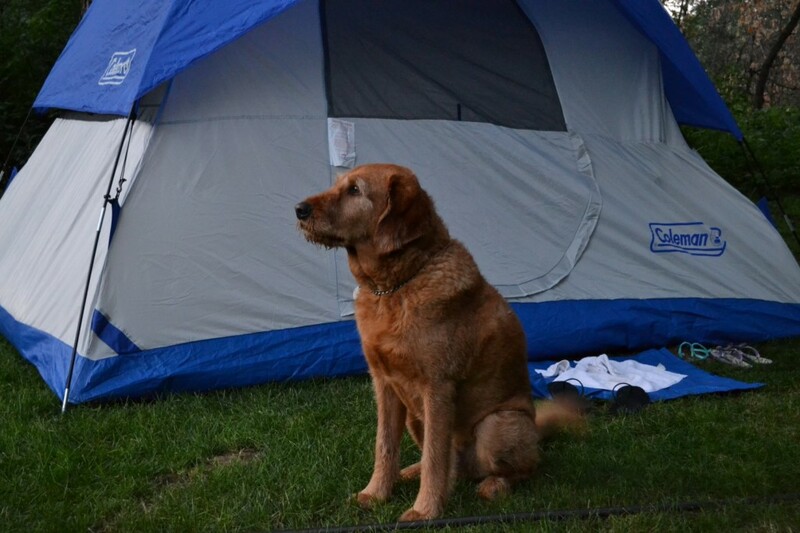 Even our dog joined in on the camping fun! Our tent is pretty small, but it works for us so far! Our last camp out we had my 2 teenage sisters, the 2 older kids and myself sleeping in the tent. It is a little cramped, but that’s camping! 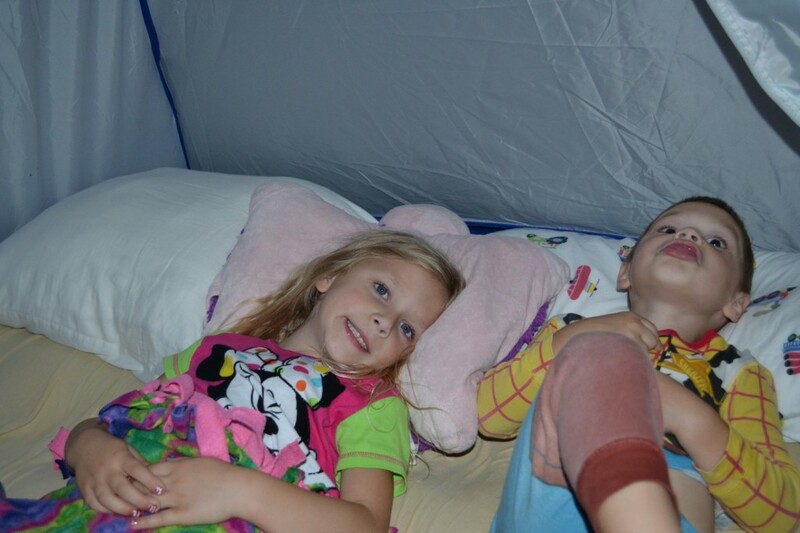 We always have fun camp outs. Even if I barely get any sleep (I would not recommend sleeping in a tent the week of 4th of July. Fireworks are so loud when you don’t have a real roof over your head!) The kids have fun and they always ask when we will do the next one! I know it isn’t “real” camping, but this works for us for now! 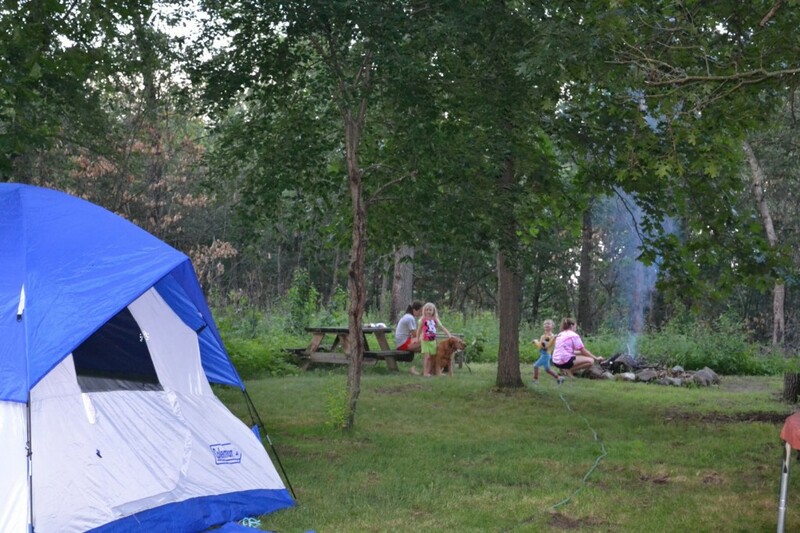 I’m sure that when the kids get a little older and we don’t have to worry about the baby escaping from the tent, we might venture out to a real campground. They haven’t complained about our choice of camp site yet, so it’s good enough for them! It’s normal at our house. It is all about spending time with each other and making memories! Boy + Hose + Trampoline = Fun! Kids always find something fun to do! First he was making “crazy rain” by putting the hose on the trampoline and going under it. I grabbed the camera because I knew there was more fun to come! Here is what ensued…. I LOVE WATCHING MY KIDS HAVE FUN! I am so excited to finally begin the adventure that I set out to do about 7 years ago! I can finally say that I am solely a stay at home mom. Well, I’ve been at home for the last 6 years but I have had every side job you could think of – laundry lady, grandma caretaker, babysitter, landscaper, and cleaning lady. Before we even got married we decided I would be a stay at home mom. We all know how when you first get married and have your first baby, money is a little tight. I was blessed enough to always find work that could fill that gap a little. Before I knew it I was running everywhere like a crazy mom just trying to juggle all my jobs! Far from what I had set out to do in the beginning. I was raised by an awesome full time working mom and the first few years of my life she was also finishing her bachelors degree. Somehow she did it all! I loved my mom and knew she would do anything for me, she went to school full time and worked full time. The world needs all different people and we need working moms. This was just OUR decision for me to stay home. Our kids are already 5,4 & 1 and this is the last year I will have the oldest one home for a half day! THE LAST YEAR I have with all my kids home! It was now or never! Mark has a great job and work was going good, so I made the plunge! Change is scary for me. Don’t really like it at all! Most importantly…this isn’t about me! I am here to serve my purpose! Right now my purpose is to serve my family, friends and community (funny, because this is what I have been teaching 5 year olds all week at VBS!) 🙂 I need to take time to be able to fully concentrate on that! Now, I need to remember to slow down and just say no to extra jobs that aren’t for me! So, here I am ready to serve! I am ready to see what God lays at my feet!